If you own a RV/Camper, then word “fun” should be part of your life. If not, then you haven't discovered Allegany Mountain Resort at Rainbow Lake. Today it is not uncommon to spend a huge amount of money purchasing a truck and camper. For many, spending all this money is a nerve racking experience. Now you discover that making reservations and planning your camping experiences has put you in another stressful situation. It’s getting harder to make reservations since the camping industry is selling more units than private investors are developing campgrounds. When demand is high and supply is low, then overnight camping charges will be on the rise. In a lot of cases a camping reservation must be made more than a year in advance. Then, what if you have to change it? It’s is usually tough luck, without a refund. If you understand the above scenario, then you will be glad there is an alternative. It is called membership camping. Allegany Mountain Resort is Western New York’s premier membership camping resort, it is synonymous with the word FUN. 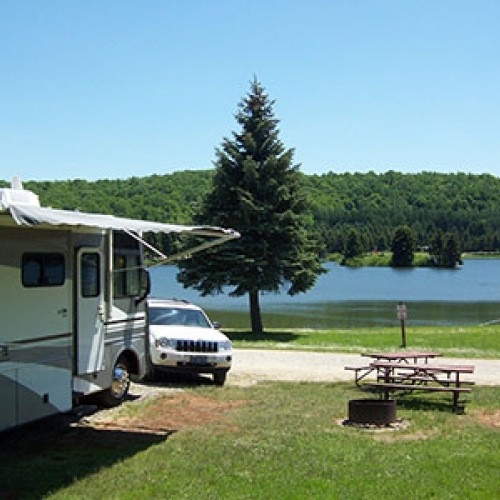 Rainbow Lake, as many know it, has over 50 years of experience catering to the need of campers. Located 10 minutes from the village of Ellicottville, it offers over 300 acres of camping facilities, abundant fishing, kayaking, sailing, swimming, dancing, food, and fun. The recreational center borders the 70 acre lake and offers two outdoors pools, indoor pool and spa, playgrounds, craft house and café and a beautiful outdoor pavilion. You will also find mini golf, horseshoes, tennis, volleyball, basketball, baseball, soccer and a walking trail surrounding the entire Rainbow Lake. There are activities galore, with a full time activities director planning events for all ages, from fishing tournaments, evening dances, special holiday events and more. The pool-side café offers breakfast, lunch and dinner along with its famous Friday fish fry. All of this is available- without the stress of worrying about reservations.